Is this some kind of modified menger sponge? Because all curves and detail looks like it has purpose and has been designed "intelligently" with cold style and not by some natural randomness like fractals usually are. This one really impressed me on stream! Everyone shell drops in *nix. Pretty cool. Too bad it's only for Mac. What sound engine was used? very very top stuff. everything fits and great "ending". Par for the course for 1k's these days, but still a nice watch. really nice choice of colors and synth, however i thought the TBC intro was better. while the visuals are really nice i dont quite understand why this got first. 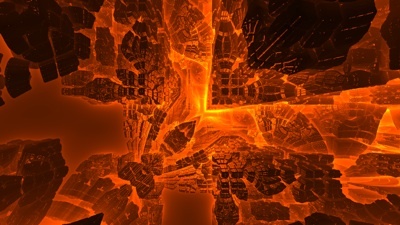 Liked the way the fractal progressed. javala: this looks like a mandelbox to me. Maybe intersected with some other similar fractal. First impression: just another box, but REALLY nice scenes. 2nd impression: wait, 1k? Impressive! What gopher said. Interesting to see an OSX exclusive though, let alone see one win a compo in a category typically dominated by Windows! this is mind-blowing. i wonder how many bytes of the executable were spend on what. QUITE impressive for just 1kb!!!! #1 and #2 in the compo were in a league of their own, but this one has the distinction of feeling less "one-effect" (yes both were). This was very nice at the compo. Unexpected variation. Sure, it's impressive, but how many 1k intros with boring fractals can there be? Visually very pleasing and even with music!? And 1k? Nice! page created in 0.018942 seconds with 15 queries.